HK Instruments produces user-friendly measurement devices for indoor and outdoor facilities. Passive outdoor temperature and light sensors are reliable in use and reduce the need for cabling. These sensors predict the need for heating in a building and control outdoor lighting sensibly and energy-efficiently. Liquid pressure transmitters can be used to monitor district heating and cooling, as well as detecting any leaks and preventing water damage. Surveillance of the differential pressure across the building envelope takes care of the health of the building and prevents serious structural problems. PTE-OI (4) measures outdoor temperatures and the level of outdoor light. 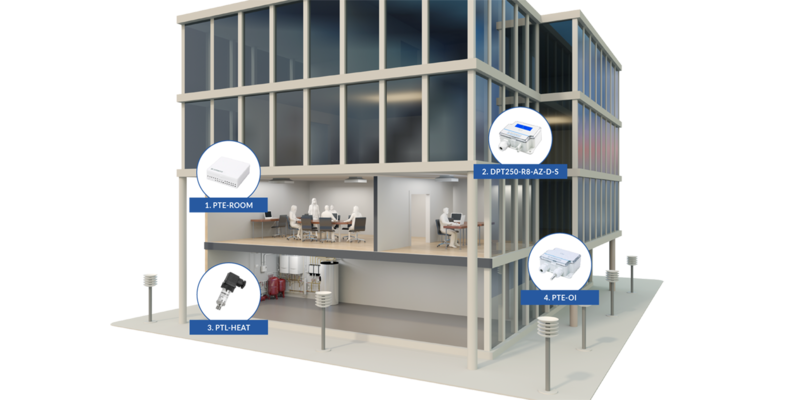 Together with PTE-Room (1), which measures room temperatures, the sensors enable the proactive control of the heating network. PTL-Heat (3) monitors pressure in the heating network and provides alerts about leaks when pressure decreases. PTE-OI carries out light measurements to determine when outdoor lighting should be switched on and off. DPT250-R8-AZ-D-S (2) measures the differential pressure over building envelope, maintaining the desired pressure balance.